February 17, 2009 by rwb, under Robotics. The servo motor is widely used in model hobbyist such as airplane R/C model for moving the rudder, ailerons, elevators and acceleration control or in the car R/C model for steering and acceleration control. In this tutorial we will learn how to control the servo motor as well as the simple close loop control algorithm for this servo motor. The servo motor basically is a high quality geared DC motor equipped with electronic circuit for controlling the DC motor rotation direction and position. Currently there are two types of servo motor available on the market, the first one is called standard servo and the other one is called continues servo; standard servo can rotate to maximum (clockwise or counterclockwise) of 120 to 180 degrees while continues servo can rotate up to 360 degrees in both direction. The exact PWM width is depend on the servo motor types and brands; on this tutorial we will use the Parallax Continues Servo which using 1ms and 2ms respectively. The Parallax servo motor consists of three wires colored with White, Red and Black. The Red and Black wires go to the Vcc and Gnd, while the White wire is use to feed the PWM signal from the PIC 16F690 microcontroller I/O port. Keep using the PIC PWM peripheral and lower the operation frequency by setting the OSCCON register and PR2 register until it meets the servo motor frequency requirement. This approach will secrify the program execution speed as we will operate the PIC Microcontroller with the 500 khz clock speed, so we simply not choose it. Secondly, we create our own PWM function to mimic the PWM signal as follow: turn on the PORT, make some 2 ms delay, turn off the PORT, and make some 18 ms delay and so forth. This approach is what I called a dirty method which is not the efficient way to do it, so we just drop this method. The third approach is to use the PIC 16F690 microcontroller TIMER0 with the interrupt to actually generate the PWM signal as the TIMER0 have wider prescaler to choose comparing to the TIMER2, but unfortunately the PWM peripheral on the PIC 16F690 only work with TIMER2 not TIMER0. Therefore we will make this TIMER0 as our PWM base generator for driving the servo motor on this tutorial. The principal we learn here could be applied to the other type of PIC Microcontroller or AVR Microcontroller as well. Instead of just demonstrating the servo motor to rotate clockwise and counterclockwise, I decide to make it more challenging and attractive by putting the LDR (light dependent resistor) as the light sensor to our servo motor and make this servo motor to behave as the light seeking machine; …hey this sound like we are touching the robotics field; …hmm yes isn’t it cool, as we know most of the embedded robotics hobbyist widely use the servo motor for robot’s arms, walkers robots, light seeking robot (know also as photovore robot) and many more. From the above circuit diagram we connect serially the LDR with the 10K trimport and use it as the voltage divider circuit to the PIC 16F690 analog input AN4 and AN5 (you could learn about Basic Resistor Circuit posted in this blog); therefore the variation on the light intensity received by the LDR will result on the variation of the voltage level to the PIC analog input port. Because of the LDR resistance vary widely among the types and brands, therefore we use the trimport and I suggest that you preset it to about 5 K Ohm on the first time and later on you can adjust it as needed. 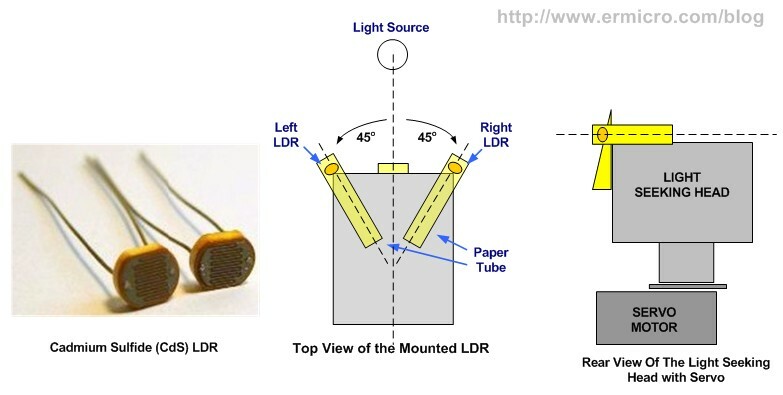 The LDR pairs will be functioned as the light sensor that controlled the servo motor position toward the light source; therefore to get the maximum performance we put these two LDRs inside the paper tube in such a way that their position is about 45 degrees away from the light source center (see the top view picture above). One of my favorite construction material is to use a thick paper (…yes it’s a paper) for fast prototyping as its easy to cut, bend, light weight and quiet strong; our seeking light head project use just a thick paper to demonstrate the servo motor concept or what we usually called it as the proof of concept (POC); so let’s do the cut and paste; and of course you could experiment with any kind of head forms or faces as you like and these following pictures can be use as the starter. 5. Return back to your last task by loading the last execution address in the stack area and continue execute the code from it. The principal we use here is to set the TMR0 register to overflow every 0.1 ms and set our own counter variable (pulse_max) to count up to maximum 200; this will give us the constant 20 ms period which is the same as 50 Hz frequency required by our servo motor. In order to generated the PWM pulse, we need to have two separate variable counter here; one is the pulse_max variable used for resetting the RC2 port (logical “0“) which connected to the servo motor and secondly is the pulse_top variable used to set the RC2 port; the pulse_top variable will be compared to the top_value variable; and if it equal than we will set the RC2 port (logical “1“). Because the TIMER0 interrupt flag bit (T0IF) in the INTCON register is not automatically reset to 0, therefore we have to manually reset it inside the TIMER0 interrupt function. The LDR pairs will constantly give the light source position feedback to the servo motor so it can always turn our paper head toward the light source; this is known as the close loop control which is one of the most important topics in the embedded system. The method of controlling the paper head we use here is called the “on-off controller” or “bang-bang controller“; this is the simplest method of controlling usually found in the heater, air-condition and refrigerator for controlling the temperature or in the line follower robot and summo wrestling robot. The more advanced controlling method is called the “PID (Proportional, Integral, Derivative) controller” which is used such as in motor speed controlling, however we will not discuss this controlling method on this tutorial, but once you understand and implement the principal of the basic close loop control presented here, later on it will be easier for you to learn this PID controlling method. The algorithm we use here is base on the differential value returned by the left LDR and the right LDR; the positive result will rotate the servo motor counterclockwise and the negative result will rotate the servo motor clockwise. The servo motor will keep rotating until the different result is zero; which mean the paper head is facing the light source. To learn more about the PIC ADC (analog to digital conversion) peripheral you could read the PIC Analog to Digital Converter C Programming posted in this blog. This program is start by initializing the PIC port used in this tutorial and continue with the PIC ADC peripheral clock selection in the ADCON1 register for using the 8 Mhz internal clock and the last is to initial the PIC TIMER0 peripheral. After the initialization process the program enter the endless loop where we read the voltage level returned by the left LDR and the right LDR and do the “bang-bang controller” algorithm. It’s important to remember that we have set the port to the analog input mode first before we use it for reading the analog signal. is the Processor fan of computer a servo motor? can i use that for a servo motor? @pichaha: As long as the supply power (i.e. polarity and voltage) is within the servo motor specification than your servo motor will be fine. The wrong PWM frequency only effecting the servo motor rotation. @unni.0p: No its not a servo motor, it usually called brushless DC motor. The servo motor used in this project is a combination of geared DC motor with the electronic motor control circuit and position feedback mechanism inside. I would like to ask, can the servo motor be driven using 5V voltage generated from 7805 voltage regulator?? If i am using 9V battery as the regulator input. Thanks a lot. My servo is working already, the motor malfunction was caused by the power shortage of the supply. But I have met another question here…I want to let my servo to turn in clockwise direction, so I let the pwm signal to has 1.0ms pulse width, after that I put a delay loop to make it turn in a certain degree(I use push button to trigger), then I stop the motor, there are still other instructions after that. My problem is the rotation works only when my delay loop is long enough. When my delay loop is short, it sometime works and sometime not works. So how if i want my servo to move just a small ditance? Any suggestion? Thanks a lot. 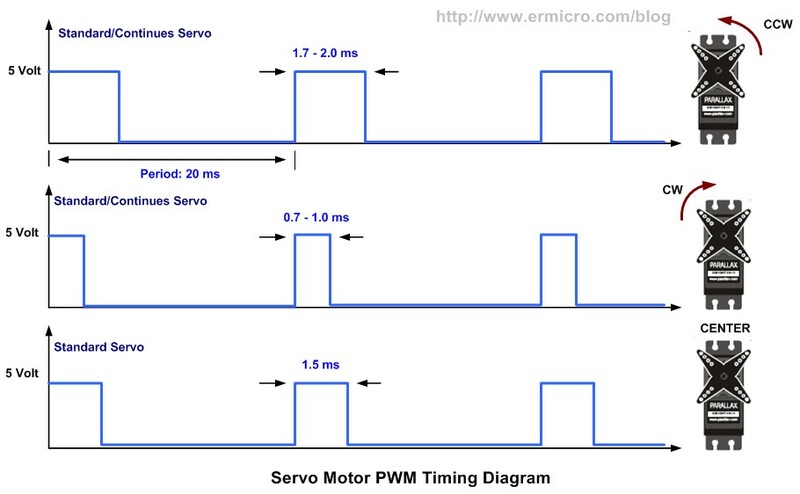 In order to rotate the servo motor clockwise at certain degree you need to supply the 1 ms PWM at certain period of time. That’s what I mean that you have to “experiment” with it (i.e. “delay loop”), because you need to know the require period before stop the PWM. The read button routine also could effecting this behavior (bounced effect). can you provide me a basic servo motor assembler code controlling with Microchip PIC Microcontroller ?? No, I don’t have the assembler code for this project. Make sure you install and configure the Microchip MPLAB IDE and Microchip HITECT PICC C compiler correctly. Thenks, I instal MPLAB IDE 8.63 and everythings working. Many thanks for yuor help! Just wondering can I use this neat method to control more servos by creating another variable pulse_top2 and top_value2 and add in the following code? Yes you could experiment with it and make some adjustment to the TIMER0 counter register (TMR0) initial value for the timing. Yes you could try to use the 14-Pins Microchip PIC16F684 microcontroller. Just remember that PIC16F684 doesn’t have the ANSELH register. Hi rwb, I’m Quang and I’m doing a project relating to RC servo, I use 6 RC servos to make a robot arm with 5 degrees of freedom! I can control the RC Servo now, I’m using 3 types of RC Servo (Hitec, Futaba and TowerPro). Unfortunately, I got problems with the power of the Servo and the ATmega, I intend to use 6V battery to power the RC Servo but it’s maybe excess the limit voltage for the MCU. I’m really need your advice to solve that. What should I do, and can you give me a Schematic to wire the servo and the MCU. I mean if the MCU and the Servo have the same power supply, they can operate smoothly, but when I’d separated them I got problems (The Servo didn’t work!!!). I’m looking forward to your guide! Thank you very much!! 0x0057 – ADC conversion started before wait time has expired following previous conversion or channel change. 0x0062 – ADC conversion started before wait time has expired following previous conversion or channel change. what can be done?or this this ok once i construct the real thing.. Yes, just construct the real project. why i can’t burn the code into my 16f690,im using pickit 2..
Make sure you install the Microchip MPLAB IDE and connect your Microchip PICKit2 to the PIC16F690 microcontroller Correctly. i already construct my circuit,the problem is when i point the light to each of the ldr i can hear and see the motor moving CCW & CW but with very very little movement and i can hear it like moving foward and reverse when i point the light to the LDR.Why is this? and my white pin which is the signal is only around 0.5 volt, where else the requirement is 3.3v right?why is this please help me..tq. Please check your servo operating voltage specification, make sure you recheck and use the same schematic/circuit as shown on the project. i am using the same servo as this project..and the same circuit.my rc2 is giving 0.5v, and is this the problem, because this servo needs 3.2 to more right for the rc2 port.and 1 more thing can i share the voltage for the servo with other’s like the LDR. Remember the RC2 port output is a PWM (Pulse Width Modulation) signal, therefore you need to used an oscilloscope when you want to examine its output. Using DVM (Digital Volt Meter) only give you an average value not the pulse HIGH value. 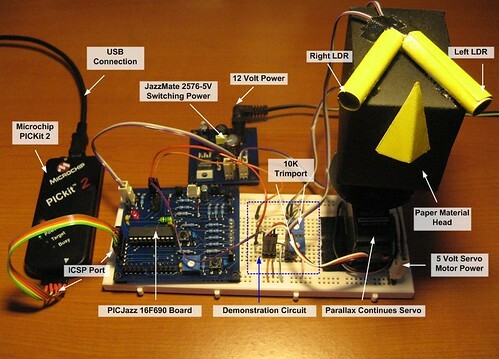 Yes you could share the voltage for the servo as shown on the schematic. Again recheck your circuit. Hi your tutorials are really good. i try to use your program in my pic16f887 but it does not worked at all. Can you give me some suggestion or modification that can be made to fit to this pic16f887. please help me. sorry for my bad english. You could read the comment #14 above. hi,can i control 2 or more servos using one 16f690??? Yes, you can and of course you need to modify this program. You need to change the configuration bit and the OSCCON register when you use PIC16F877A since the PIC16F877A microcontroller has no internal oscillator clock like PIC16F690. The PIC16F877A also don’t have the ANSEL and ANSELH registers. IF im using pic16f886,but i want to use a 4mhz external cyrstal how do i do so? 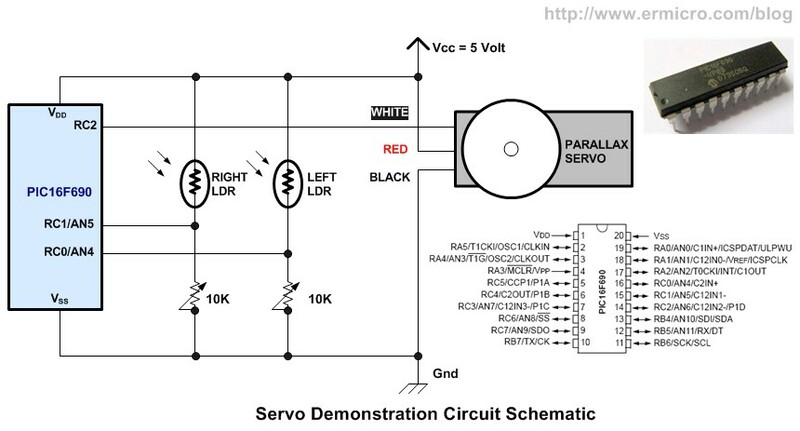 thank you,i read it but i cant really understand.so by changing this,im i still able to move this servo motor and achieve a signal if i use the oscilator? Yes, you need to modify the TIMER0 timing in order to achieve the same signal result. 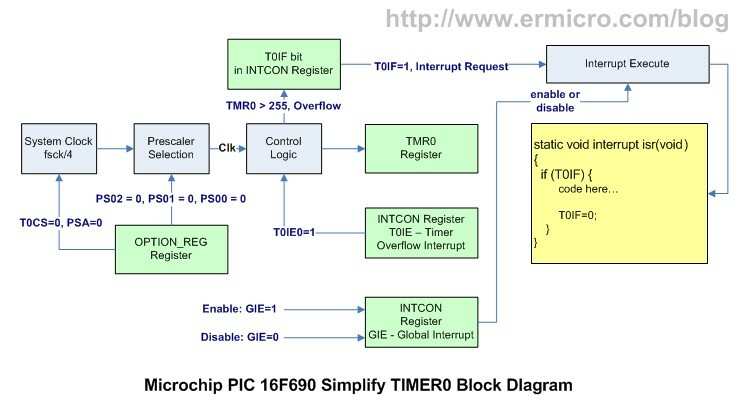 Please read the article and the Microchip PIC16F886 microcontroller datasheet for more information. Thank you very much. I was looking for a servo interface to a PIC. This is an excellent article and simply the best explanation I have found of creating a PWM pulse with the hardware timers. Thanks again, it was extremely useful. In MikroC you should use GO_DONE_bit instead of GODONE in Microchip HI-TECH C. Or simply use the MikroC ADC_Read() ADC library to read the ADC value. Thank you very much, you are very helpful. Quick question, by any chance do you have any tutorials on ultrasound in arrays configuration? Question: I am attempting to implement your project, but I am getting the following error. Error  C:\Documents and Settings\ale\Desktop\FIU\Senior\Codigos\infra-II\Infra.c; 100.1 undefined identifier “GODONE”. I am using MPLab IDEv 8.87, any recommendation! Check your MPLAB IDE installation and make sure you select the proper Language Toolsuite (e.g. HI-TECH Universal Toolsuite), from MPLAB IDE menu Project -> Select Language Toolsuite. Thanks for your reply. i just added the following line of code “#define _LEGACY_HEADERS”, and compiled without problem. Now I have another question, since I my board is an easyPIC board I am using the Mikroprog to download the ” .HEX”(created in MPLab) file to the MICRO. It should work fine rigth? Yes you could use the mikroProg to load the HEX file produced by the Microchip MPLAB. The schematic is shown in the project. You could Contact the sales@ermicro.com regarding the JazzMate board. Hi, Instead of cardboard paper. I was wondering if we install a PV panel of 4 to 6 kgs, to sense the sunlight. would code be different from what is written and motor specification? For that kind of load, you need to use a big torque servo motor for moving the PV Panel. 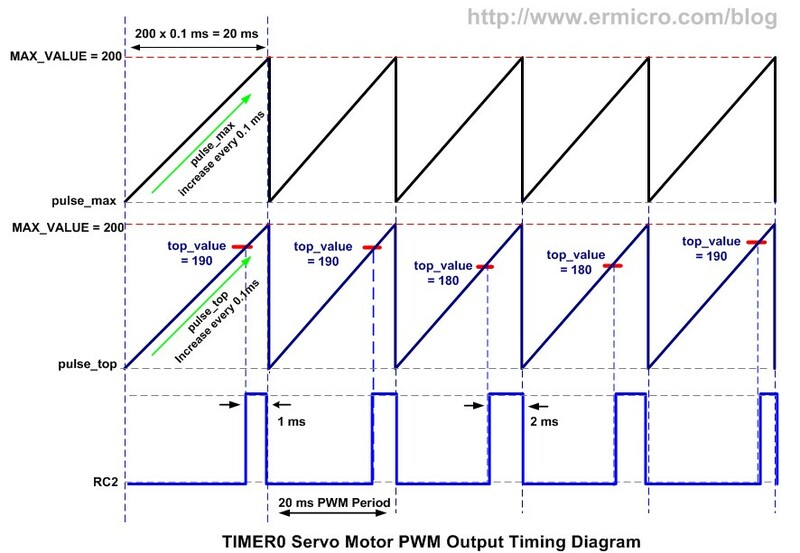 About the code you need to check the servo motor control signal pulse specification, usually it use a similar control signal pulse as described in this project. I am knew to this site and after reading this text I find that it is very informative. To obtain 50Hz I will use some other approach on Tomer2. O.K. I accidentally hit some keyboard button and post the previous message and can not find the way to edit it so ignore it! I am knew to this site and after reading this text I find that it is very informative and useful. To obtain 50Hz I will use some other approach on Timer2. 2.COMPARATOR and PERIOD REGISTER – comparator compares two values: one FROM Timer2 and the other FROM PERIOD REGISTER. When values matches COMPARATOR SEND ONE PULSE to postscaler and reset timer2. Period register is 8-bit wide and can have values from 0-255. So, THIS is that another divider with values in between 0-255! 3.postscaler – divides in steps 1, 2, 4… up to 16. – after that postscaler sets flag bit TMR2IF. Very often I am using Timer2 to have pause in milli or micro seconds. Please, correct me if I am wrong. Thank You.